That's because there isn't really a “point” to Minecraft. The video game lets players build virtual worlds out of blocks, and sometimes there are zombie or animal attacks. 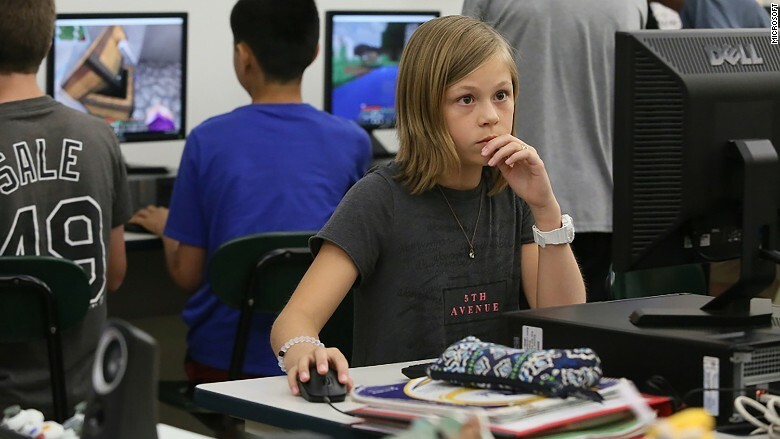 But at school, students can use Minecraft to create their own games and story lines. Rezac has spent the past few weeks building a quest-driven maze inspired by “The Fifth Wave,” a science fiction movie about earth after an alien attack. Rezac says she doesn't think too much about how to get a good grade. Competition among classmates doesn't really exist either because everyone builds their own version. “It's more fun [this way],” she said. Microsoft(MSFT, Tech30) is pinning a lot of hope on Minecraft as a way to break into the education sector. The game's massive popularity with kids (and adults) is one of the major reasons that the software giant bought Mojang, Minecraft's developer, for $2.5 billion two years ago. I think it is a good time for kids to do this version of Minecraft, because then they will get smarter to do good in other schools.